As part of the Lactofree ambassadorship programme I was recently sent out a little hamper of goodies to help me make the perfect cheese toastie, which was rather nice! The hamper was filled with Lactofree's Mature Cheddar (a block of it and a bag of it pre-grated), an assortment of condiments and a brand new toastie maker from Russell Hobbs. Unfortunately I don't think the latter was up to much - the catch snapped off on it's first use (it is still useable but you have to hold it shut, grrrrr) but it goes without saying that the Lactofree cheese (which is on our shopping list, along with their butter, semi skimmed milk and chocolate milk every single week) was delicious. When I originally went (entirely) dairy free, I definitely missed cheese the most. 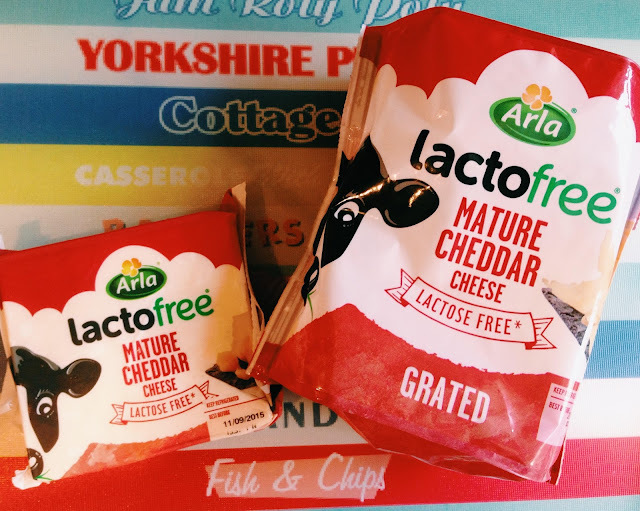 Although I am still dairy free for the most part, since working with Lactofree I have discovered my intolerance is actually only to the lactose, which means I'm able to eat the Lactofree products when I fancy something dairy-y - and the mature cheddar is my favourite of them all. The new grated version makes mealtimes super easy - whether you're knocking up a toastie like I was challenged to, or using it to sprinkle on top of pasta - there's no denying it's extra convenient to have a bag of ready grated cheese in the fridge. We've had a really wet and chilly summer these past couple of weeks and a cup of tea and a cheese toastie was just what the doctor ordered for lunch on Monday. I like to keep mine simple; cheese and ham, cheese and onion, cheese and avocado if I'm feeling a bit fancy (I add the avocado afterwards). This time I paired my cheese with some REALLY fancy red onion chutney from Makers & Merchants and it. was. goooooooood. Unfortunately, despite tasting amazing, my toasties were not aesthetically pleasing enough to be photographed (we all know how fussy I am about my photographs) - plus they were hoovered up by the children within about 8 seconds of being plated up. But I think we all know what a toastie looks like, and I did manage to find some delicious looking varieties on Pinterest (check out my foodie board below for inspiration). Yum! Follow Katy from Modern Mummy's board Delicious x on Pinterest.